brandflakesforbreakfast: photo chicken bucket art. it's a thing. photo chicken bucket art. it's a thing. Welp, can you believe it? It's been 60 (count them, 6-0) years that KFC has been in Canada. 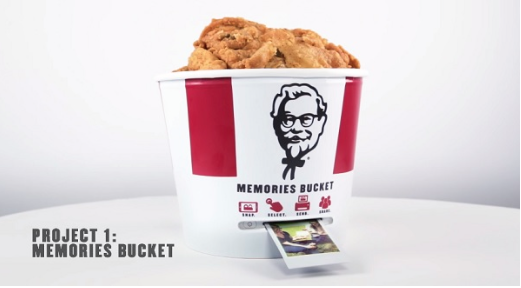 And to celebrate, KFC is letting consumers document their precious memories in a highly unusual way - by using the iconic bucket as a photo printer! You read that right. Consumers can snap a photo, connected it to the bucket via Bluetooth and PRESTO! Photo chicken bucket art.